Smart city deployments based on Internet of Things (IoT) concepts continue, but designers and system integrators are challenged to both contain costs and provide more capabilities. Many readymade hardware and software solutions are available to help achieve these conflicting goals, but designers and system integrators must ensure they are also rugged, secure, scalable, manageable, and easily integrated with already deployed networks and IT infrastructure. An example of an application with ever increasing capability demands is the smart streetlight, one of the more widely adopted and most visible elements of a smart city. The typical smart streetlight may incorporate a solar radiation sensor to detect sunlight, a motion sensor to detect the presence of vehicles or pedestrians, and some means of connecting back to a central management system. What started as a simple idea, to make lighting a city more efficient and cost-effective, has helped turn the humble streetlight into a key element of the smart city. In large part due to their pervasiveness, they are a natural aggregation point for other smart city sensing applications, such as air quality, humidity, wind, temperature, vibration, anemometers, and IP cameras for traffic monitoring and security. Also, with the rise of connected vehicles, and the development of vehicle-to-infrastructure (V2I) technologies, the streetlight will continue to play an increasingly important role, said Brook Lee, product manager at Advantech. With all these added features and requirements, determining the right hardware and software to support a streetlight is a good study in smart city requirements setting and matching. With more capabilities comes the need to rethink how data is gathered and processed, said Lee. It no longer makes sense to send all the data to the cloud for analysis. This introduces unnecessary latencies and bandwidth usage, while limiting scalability and manageability. As more sensors and features are added, the new devices and sensors need to be provisioned and managed securely. These expansive capabilities not only require more processing horsepower at the edge, they also require more flexibility in the RF front end to accommodate multiple wireless interfaces. Along with security and remote management, these requirements call for smart gateways, said Lee. As an example, he pointed to the Advantech UTX-3117 IoT Gateway. This gateway features the Intel Atom® processor E3900 with up to four cores and an operating frequency of up 1.6 GHz, as well as 8 Gbytes of LPDDR4 memory. With this compute power, Lee said, "We can do data analysis locally." From a video and imaging point of view, the processor's highlights include Ultra HD 4K support and the ability to analyze up to 15 1080p decode streams simultaneously at 30 fps. "With higher performance, you can now do image and video analysis," noted Lee. Other I/O includes two USB 3.0 ports and 2 COM ports, allow for the addition of more sensors or cameras over time. 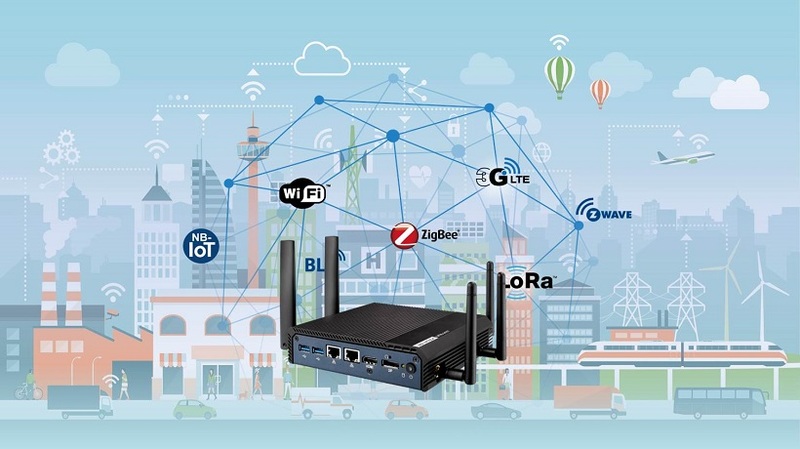 To simplify the addition and provisioning of these new capabilities, the UTX-3117 is supported by Advantech's WISE-PaaS and remote monitoring and management (RMM) service. This is a preconfigured cloud service software to connect sensors to the cloud and push firmware updates. For security, the UTX-3117 uses TPM 2.0, and implements the Wind River PulsarOS, which "has the security to prevent hacks," said Lee.Pulsar is a containerized Linux OS that delivers patches and security fixes on the fly from a Wind River repository. According to Lee, this protects devices from the risks associated with unmanaged open source technology. Wind River has committed to long-term support for Pulsar OS, which ensures long-term security updates. PulsarOS is also certified with Microsoft Azure and Amazon Web Services (AWS), making it easy to connect with these services. Here developers can implement a variety of cloud applications, such as predictive maintenance or big data analytics. While performance and security are critical, the system also needs to be able to operate over a wide temperature range. In a typical deployment, the UTX-3117 would be placed within an enclosure to protect it from the elements, but that does expose it to higher temperatures within that enclosed environment, said Lee. As a result, the gateway was designed to have an operating temperature range of -20˚ to +60˚C. At a processor level, Advantech chose the Intel Atom processor E3900 because it has an operating temperature range of -20˚ to +105˚C, along with a 7-year warranty, and reliability up to 15 years, said Lee. The UTX-3117 is also compact, measuring 128 x 152 x 37 mm. For Lee, the next steps for smart city deployment using lighting infrastructure include connecting with parking lots to give notice of vacancies, and to connect with moving vehicles. In the meantime, delivering secure, scalable, and easily managed IoT gateway solutions that can perform analysis at the edge is the foundation of what will be the next generation of smart city solutions.